Testing testing 123...just not all the time! Now don’t get me wrong, tests definitely have their place in the classroom. They can be a very effective way of checking your students' ability to recall information with very little effort. They’re also easy to mark and report on. There’s nothing like cold hard data to help you write your reports. But they are not the best assessment solution for every subject. They are also limited in their ability to give you insight beyond a student’s ability to recall information. For example, during a test a student may be able to recall the Federation occurred in 1901 but it’s also important to check their understanding of why Federation happened, the significant events that led to it and the contribution of important figures such as Henry Parkes. Each student will explain their understanding of this important event in their own way and a test may not be a meaningful and authentic way to check their understanding. So what are the alternatives to tests? Let’s look at 5 alternatives to tests that you might like to try in your classroom. This is a great opportunity to incorporate technology in to your lessons. 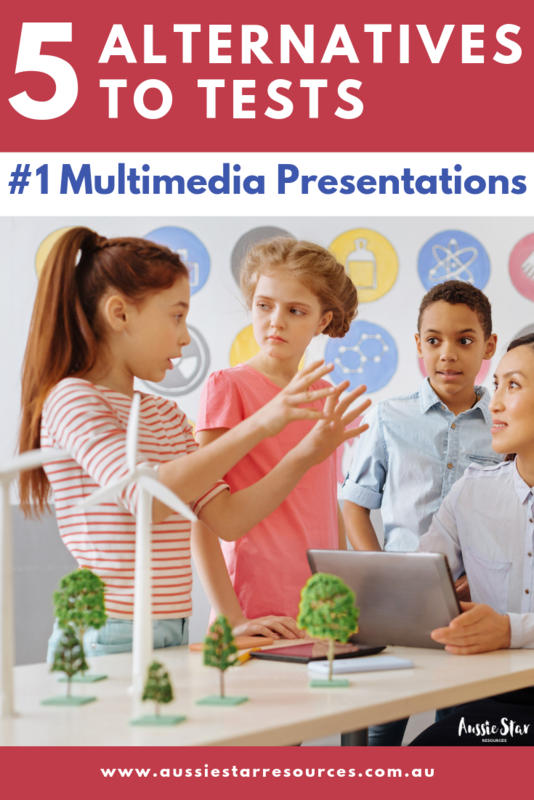 Your students might like to make a news segment about a special event, or perhaps a mini documentary about their Earth Science topic or a mathematical concept. Maybe they can reenact a chemical reaction using stop motion or generate a PowerPoint presentation or slide show of their latest book report. The possibilities are endless. Dioramas are a great way for students who love creating and crafting to show their understanding. I’m always amazed at how creative students (and often their parents) can be when creating dioramas. I’ve seen them made from LEGO, air dry clay, plasticine, wood and cardboard. While the construction and presentation of dioramas is important it’s equally important that students demonstrate their understanding of the learning outcome. This can be done with a written or oral component. 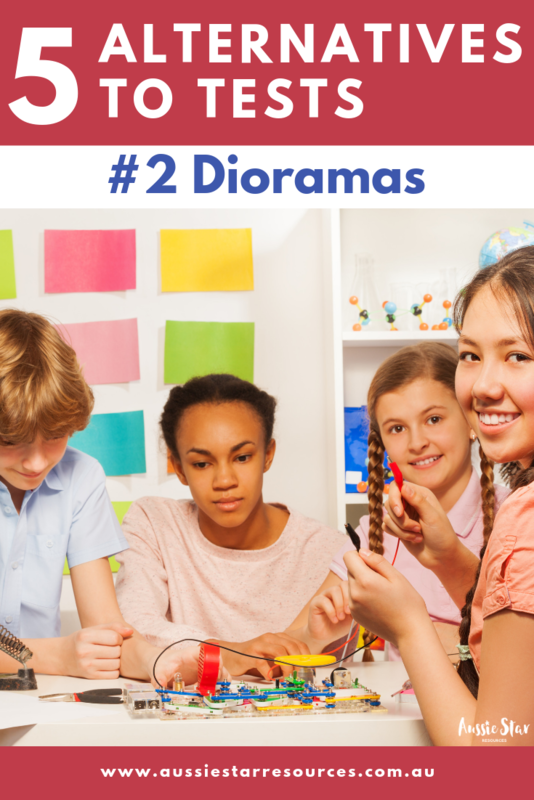 A great idea is to have parents and other classes come through your diorama ‘gallery’ and ask the students to explain their diorama. Providing prompt questions can help or even preparing other classes with questions might help the process. Turn the tables on your students by asking them to teach you, their parents or their peers about a concept, topic or skill. They will need to carefully plan their lesson and write a detailed lesson plan including an objective and anticipated outcome- this should be directly linked to the curriculum outcomes. Students should also check for understanding and reflect and evaluate their lesson after to consider how they could have modified or improved their lesson to teach it better. This works in beautifully with procedure writing but can be linked to subjects such as maths, science and even PE. 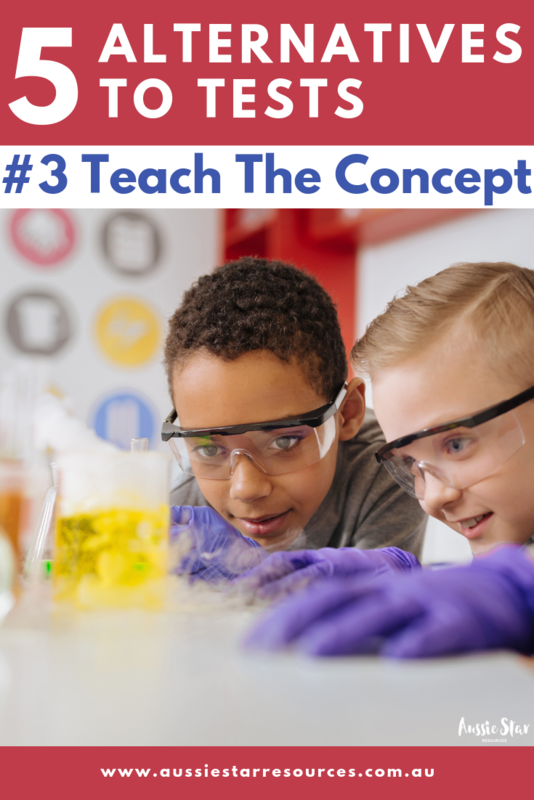 Rather than teaching the concept and having to speak in front of their peers (for some students this is a terrifying concept) students can write a detailed instruction manual with graphics and diagrams to help convey their knowledge and understanding. This could be completed on the computer or written by hand. Photographs could also be used to help present the steps. 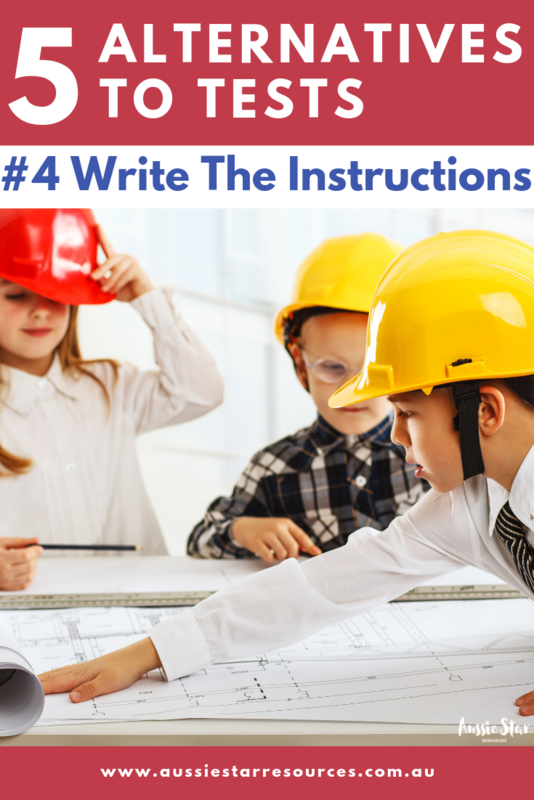 It can be helpful to provide examples of different types of instruction manuals to inspire students. To test their manuals students can swap their manuals and follow the steps to see how effective they are. Constructive feedback from peers could be written as part of the assessment task. I have used this in maths as part of our unit on probability. 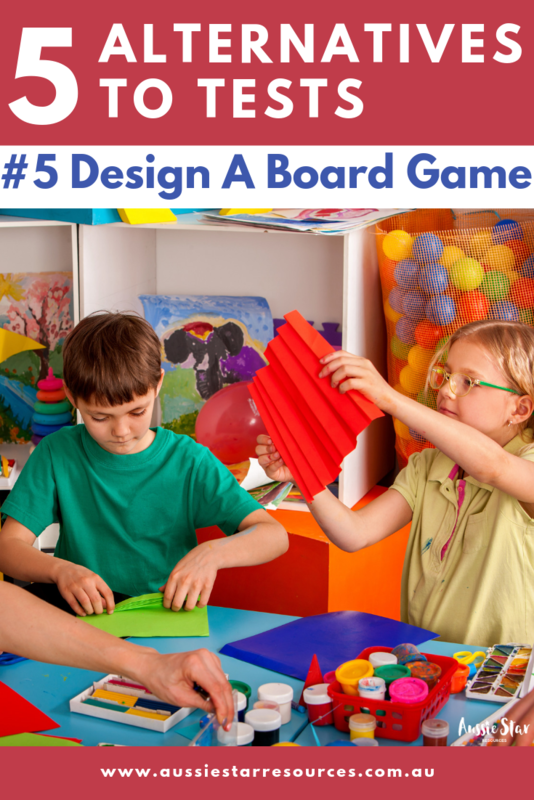 Students love the opportunity to be creative and design the ultimate board game. Like all activities it does require guidance and scaffolding to ensure the learning objectives are not lost amongst the cardboard, straws, spinners and hot glue guns. A process journal can help with this so that students log their planning and progress throughout the construction to ensure they are on task and on track to reach their objective. It’s important to provide focused time for writing in a process journal - don’t rush it and provide helpful prompts to get them writing as it takes practice to master writing a process journal. When they’re all done it can be great fun to have a lesson for students to play each other’s games and provide constructive feedback. Hopefully you’ve been inspired to try a few different assessment strategies. There are many more so follow our Pinterest profile to keep an eye on ideas we find inspiring. We have an entire board dedicated to meaningful assessment ideas which you can follow by clicking here. If you're looking for assessment tasks and activities with a difference check out our Australian Explorer Assessment Planner and our Earth Sciences Expo Assessment Planner.